Just days after its initial rollout, the WhatsApp Business app has now debuted in India. The standalone app offers a simple tool for small businesses to let them communicate with their clients and customers in an easy way. Facebook-owned WhatsApp announced the plans to kick off its WhatsApp for Business initiative back in September last year and launched a pilot by partnering with companies such as BookMyShow, Netflix, and MakeMyTrip. The new app, for small businesses, arrived first in a handful of markets, including Indonesia, Italy, Mexico, the UK, and the US, on Friday. Interestingly, the app was initially tested in India and Brazil ahead of its public release. The WhatsApp Business app is now available for free download via Google Play in India. It is compatible with devices running Android 4.0.3 and above. A version with similar features is also expected to be available for iOS devices in the coming future. Targeted at small businesses, the WhatsApp Business app allows companies to connect with their customers and be a part of the messaging platform that has over 1.3 billion users worldwide. Unlike the original WhatsApp app, the business-centric offering allows businesses to create their own profiles with information such as business description, email, or store addresses, and website. It also provides smart messaging tools to let businesses use quick replies and give fast answers to frequently asked questions. 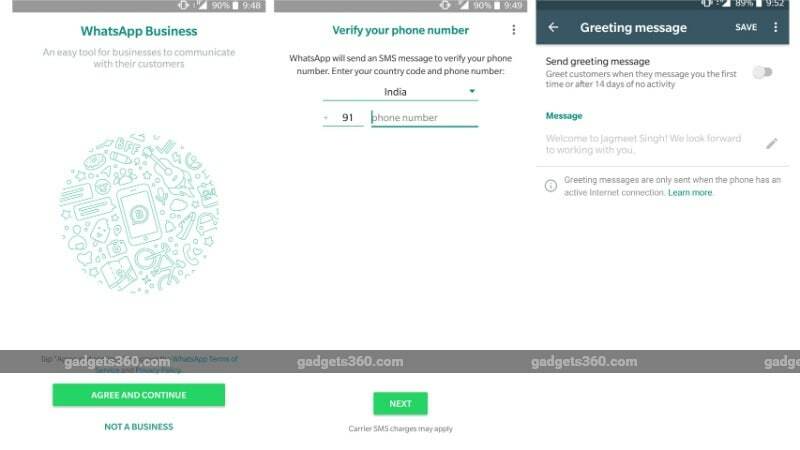 The app also has options to send greetings messages to new customers and set away messages when the companies are busy. Further, there are metrics such as the number of messages read and WhatsApp Web support to let companies send and receive messages directly through a desktop. Alongside delivering the features to enable corporate communication for small businesses, WhatsApp is in plans to mark some businesses as Confirmed Accounts over time. Citing a study conducted by Morning Consult, more than 80 percent of small businesses in India and Brazil consider WhatsApp helps them communicate with customers and grow their business. As many as 84 percent of SMBs (Small and Medium Businesses), particularly from India, think that WhatsApp helps them communicate with customers, while 80 percent of Indian SMBs believe that WhatsApp helps them grow their business, as per the data provided by the company last week. In terms of some major similarities with the original WhatsApp, the WhatsApp Business app allows businesses to set privacy for their profile photo, about information, and status as well as lets them block any of their contacts and enable read receipts. The app also has a live location feature that helps companies share their live location with their clients and customers. It additionally allows businesses to make voice and video calls. Notably, the app offers end-to-end encryption for all the messages and calls it circulates to restrict any third-party access. We've reached out WhatsApp for more clarity regarding the rollout and will update this space accordingly. As per the official data provided in February last year, WhatsApp has over 200 million monthly active users in India. The instant messaging platform is making things difficult for its rival by introducing compelling features such as Delete for Everyone, YouTube integration, and Notification Channel support for Android Oreo devices. Moreover, it is exploring new avenues and is apparently even set to integrate a UPI payments feature in the near future.